We’re making changes to the look and feel of the website. One of the areas that you’ve told us you want to see change, is the lender dashboard. You’ve told us that you would like a more visual representation of your investments and use of the platform. We’ve been listening and have started implementing some changes. 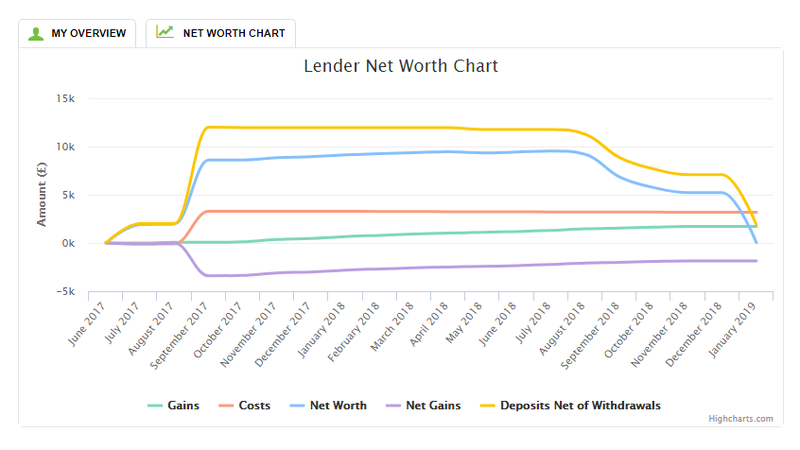 To help you understand the charts we’ve taken a few example charts of lenders at various stages of their lending journey and with varying loan book performances. 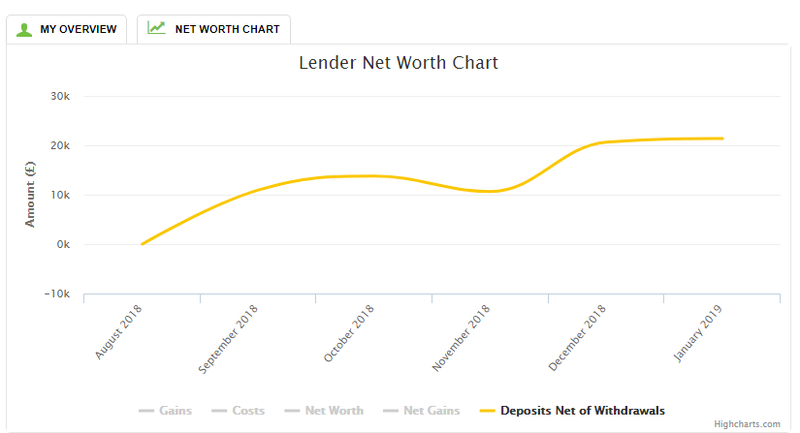 The yellow line on the chart represents, deposits and withdrawals. On the above chart, you can see the yellow line gradually increasing between August an October 2019, before there is a dip, this dip represents a withdrawal of funds from the platform, before another significant deposit. 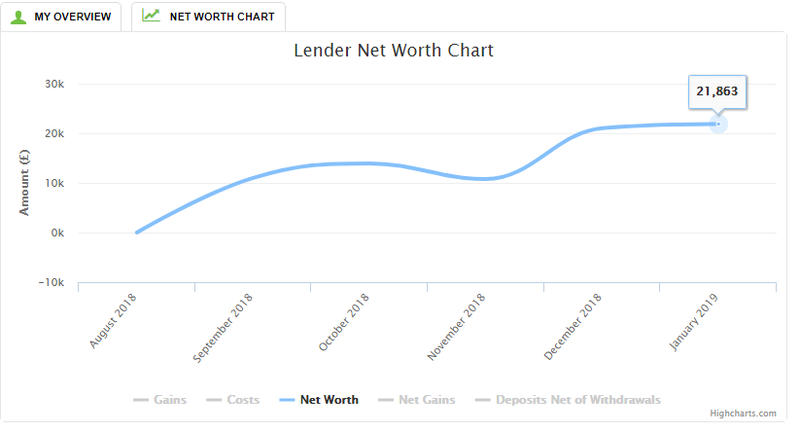 The green line indicates ‘Gains’, gains are increases to your net worth from interest, promotional credits or capital gains from secondary marketplace trading. Notice here that the gains are £490 at January 2019. Here we see the same lender’s costs line, represented in orange. Costs are incurred through fees, capital loss from secondary market trading, capital loss from defult adjustments and bad debt. Notice that the y-axis (£ amount) will auto-adjust to fit the data on the chart, as you click on each element. Above you can see the purple ‘Net Gains’ line, this is the net of the green and orange lines. If the orange ‘costs’ line is fairly flat, the purple line may hide the green line. 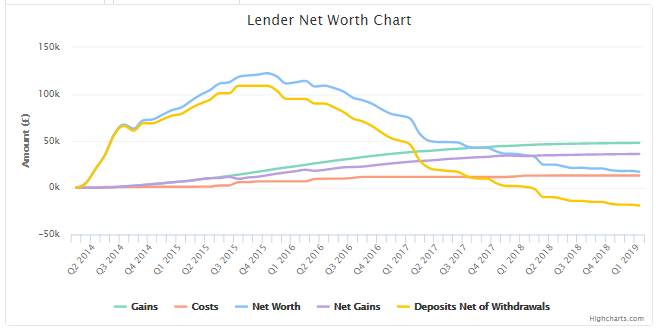 The blue line shows the Net Worth, this is assets (principal remaining on outstanding loans) plus Gains. 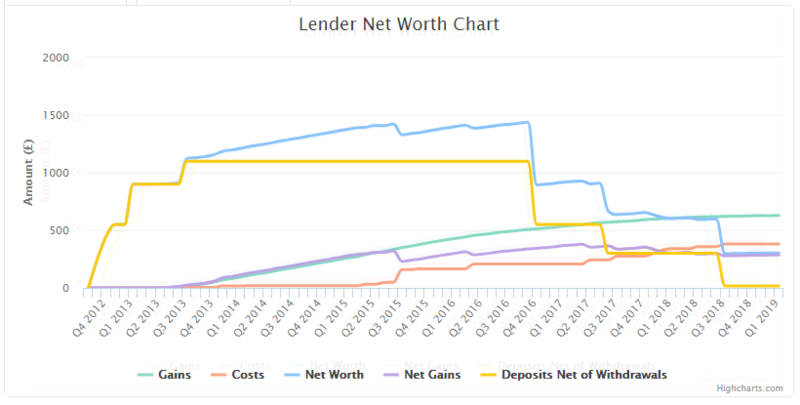 If we put all of these lines together this is what the lender’s Net Worth Chart looks like. 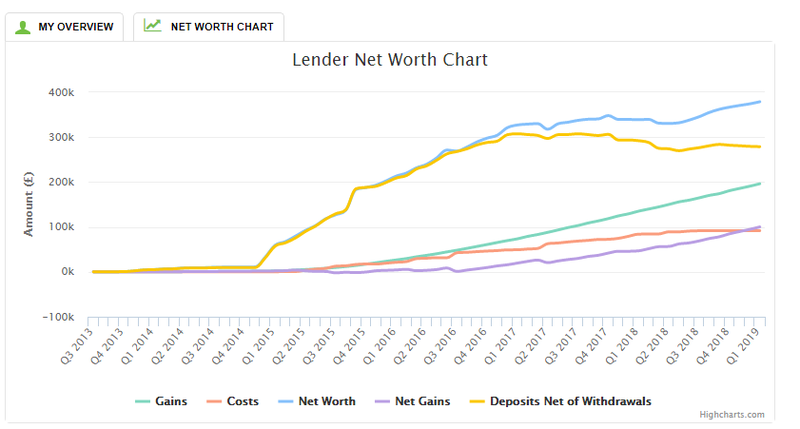 Now you understand what each of the lines in the chart represents, let’s have a look at a few other lenders’ charts and see what information we can interpret from them. What can you tell from this chart? The submarine lender has been lending for three years and has now fully divested after needing their funds to pay for a deposit on buying their first property. 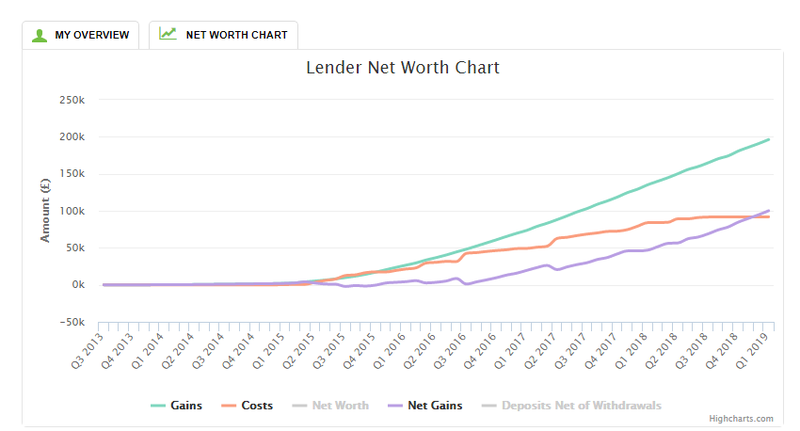 Between Q3 and Q4 of 2016, the lender makes their first deposit of approximately £2,500, and then seemingly don’t make any loans for a period of time, as the purple line does not move until Q1 2017 when they start to receive their 1st repayments of interest and capital. 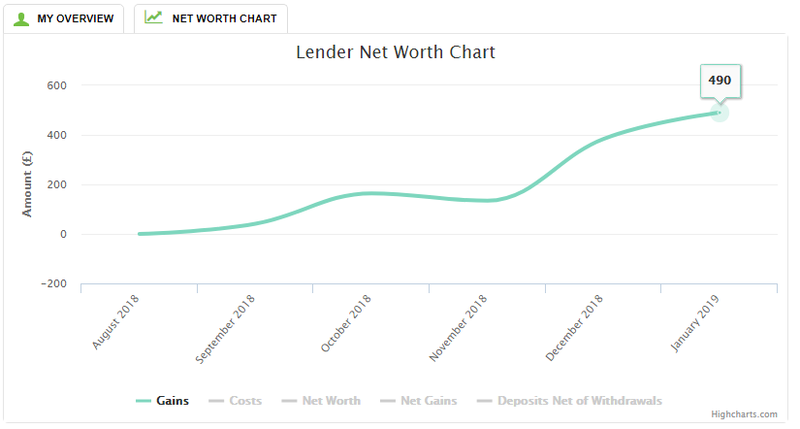 Following their deposit, the lender decides to substantially increase their capital and makes a further deposit of approximately £10k in Q1 and maintains this level of capital whilst continuing to invest in loans, and continues to receive interest on this capital invested, indicated by the purple line. 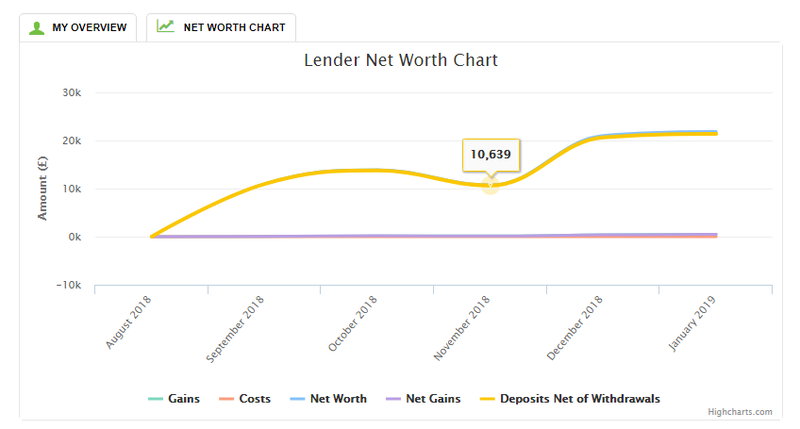 The blue line indicates the total value / Net worth of their account, this can be seen by Capital deposited (yellow line) + the net gains (purple line). 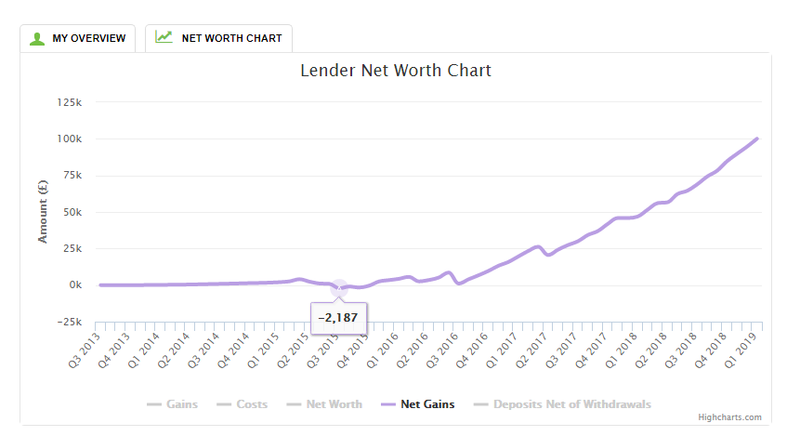 Their net worth continues to appreciate until Q4 2017 where the lender makes a withdrawal, reducing his available capital to just under £10k but continues to earn interest on this capital (as shown by the purple line), until beginning to divest midway through Q3 2018. The lender’s orange line remains fairly flat throughout their activity, which indicates that the lender incurred minimal costs, i.e. did trade extensively on the secondary market, and instead likely chose to take part in loans in the primary market and hold these loans, only incurring small costs during their divestment phase. Overall this lender at the point of exit had a total gain of £3164.41, primarily through compounding their returns over the 3-year term, earning them an impressive average Net Return of 21.7% pa. The same lender also opens an IF ISA account. Above we saw how the submarine lender after making two relatively significant deposits for his account became active quite quickly, other lenders are a bit more tentative, choosing to first try out the platform for over 2 years (Q3 2013 to Q1 2015) before investing more significantly, eventually building their account up to approximately £300k. 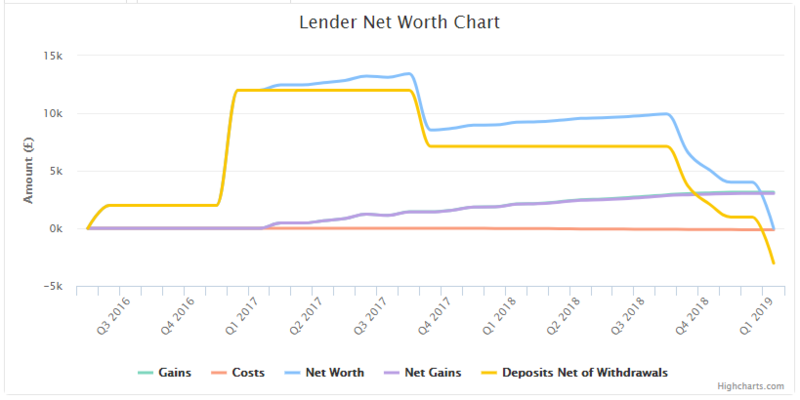 During the early phase, this lender has a difficult start, their first few loans under perform, and they sustain a net loss early on, this can more clearly be seen by looking at the purple net gains line on its own below. 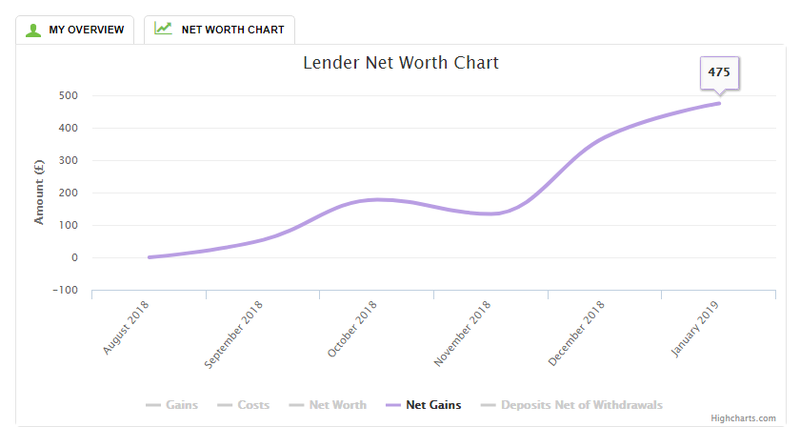 Every dip in the purple and blue lines indicates a likely default on a loan held by this investor, but by continuing to compound their returns and gradually increase their total investment, the gains start to steadily increase. Below you can see how the costs (orange), net gains (purple) and gains (green) varied over the initial investment period. Undeterred by their initial losses, the lender takes a long-term view and now, after four years of active lending, they have been able to build their Net Worth to over £380k. This lender has earned an average Compounded Net Return of 10.57%pa* and has invested in over 225 loans across their history. Not every lender has the nerve to take a long-term view, it can be quite scary to try something new and be disappointed early on. Whilst we take measures to mitigate defaults and losses to lenders, it is normal to expect that from a large portfolio there will be a natural level of defaults. As with this lender below, who had a similar experience, but chose to divest. Here we see a lender that similar to the above lender in story 2, sustained early losses shortly after making their 1st deposit, indicated by the purple net gains line dropping below £0. This dip is fairly significant, indicating that this is likely due to a substantial investment in a single loan that went into default shortly after committing to it, i.e. the lender’s portfolio was not diversified at this point. Notice that the despite the early dip, the ongoing performance does compensate, within another six months this lender would return to break even. Different lenders approach lending in different ways, some lenders start off small and then significantly increase their capital on the platform, other lenders may have less capital available to invest and will instead slowly grow their investment capital until they reach their investment limits. Some lenders will invest, build a portfolio, then withdraw their investment capital and reinvest their profits. This is a perfectly health strategy too. Below we’ve looked at a lender that has allowed auto bid to grow their portfolio, periodically dipping in to take out cash when needed. This lender’s account in comparison to the other’s we’ve reviewed is relatively smaller in terms of capital invested. Reaching a high of £1,100 through regular deposits. Once reaching their maximum capital deposited, they appear to have continued to compound their returns over a significant period of time (over 3 years). During that time we can see where they incurred some defaults (See the blue and purple line dips), but overall their investment continued to gradually appreciate (see green and blue lines) until they chose to gradually divest between Q4 2016 and Q3 2018. 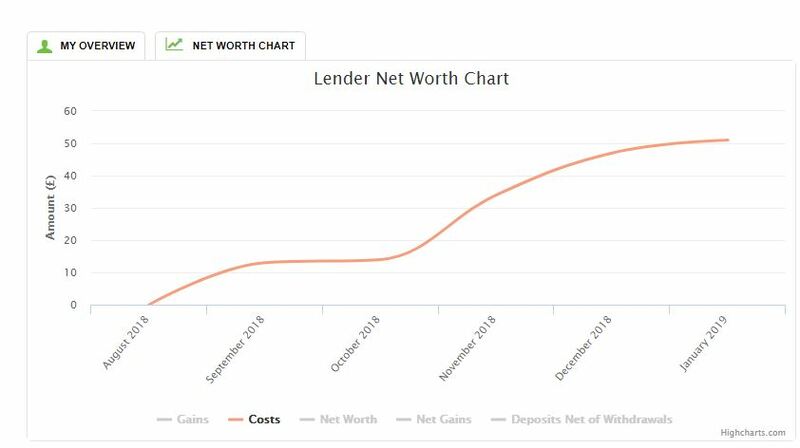 This lender has built a portfolio that generates average Net Returns of 14.26%* and enjoys taking out the profits. They have been able to supplement their disposable income, with profits from their investing. We have many semi-retired people looking to manage their investments to generate a passive income, where they have access to profits each month. Remember, a yellow line that becomes negative is an investor who has withdrawn more than they deposited, i.e. they have taken their profits out. We would love for them to come back and reinvest with us, but we understand how people’s financial needs vary over time. Whilst many lenders make healthy returns, lenders don’t always get it right, of 1445 active lenders, 160 (11%) have a net return less than 0, i.e. they have taken a loss, whereas 1285 (89%) have net return of 0 or above. Of the 1285 positive lenders, 973 (67%) have received 5%* or above, and 546 (38%) have 10%* or above, with a lucky 254 (18%) who have earned over 15% pa*. See more on the Net Returns Histogram on our stats page. *This analysis is correct as of 23rd January 2019. Please remember that historic performance is no guarantee of future performance and that the Net Returns quoted refer to individual lender accounts with varying investment styles and strategies over extended periods of time, and may not be indicative of what you can expect to receive through your own lending experience. To learn more about the risks of lending, please visit our risks page. Or to learn more about lending on the rebuildingsociety.com platform, visit our lender library.